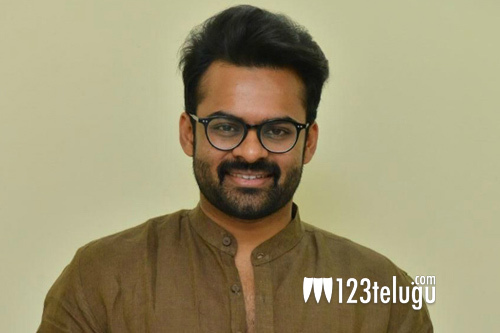 The makers of young Mega hero Sai Dharam Tej’s upcoming film, Chitralahari, released the film’s second song ‘Parugu Parugu’ a couple of days ago. The song received a good response from music lovers. Apart from the catchy and deep lyrics and DSP’s composition, there is yet another factor in the song that’s left everyone talking. In the ‘Parugu Parugu’ lyrical video, Sai Dharam Tej’s name was mentioned as Sai Tej. Has Sai rechristened his name as Sai Tej? Stars undergoing name change for the luck factor is nothing uncommon in Tollywood. Let’s see if this change of name will bring Sai Tej that one elusive hit with Chitralahari. Chitralahari is scheduled to hit theaters on April 12. Nivetha Pethuraj and Kalyani Priyadarshan are the leading ladies and Kishore Tirumala is the director of the film. Mythri Movie Makers banner is bankrolling the project.